Cynthia A. Sherwood is the founder of Sherwood Boutique Litigation, PLC. Her practice of law is focused on providing clients with aggressive criminal defense and civil litigation defense. 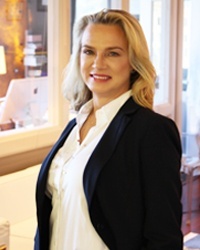 She is best known for her personal attention, absolute discretion, and fierce representation of her clients. Ms. Sherwood received her undergraduate degree in Political Science with honors in 1997 from Delta State University. She received her Law Degree from Vanderbilt University School of Law, where she also received the Carl J. Ruskowski Clinical Legal Education Award. This prestigious award is given to the graduating student who demonstrated excellence in the practice of law and exemplified the highest standards of the legal profession. Throughout the past two decades, Cynthia has relentlessly fought for her clients. She has been recognized as a leader the in legal community and as a legal commentator in the Nashville area. What gives her the most joy is coming to work every for the clients of SBL clients. She is admitted to practice in Tennessee and is a member of the bar of the U.S. Court of Appeals for the Sixth Circuit and the U.S. District Courts for the Middle and Western Districts of Tennessee. Healthmart USA, LLC, et.al. v Direct Assistants, Inc.
John Rich v Sevier, et.al.